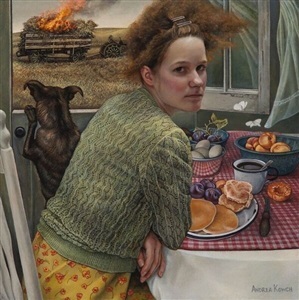 Even before the doors open, Andrea Kowch’s solo show at RJD Gallery is sold out with the exception of a single painting. All of the paintings were purchased before the details of the compositions were fully conceived, according to the gallery. “Andrea Kowch: Into the Wind” opens on Saturday, August 26, 2017 with an Opening Reception from 6 to 8 p.m. Kowch is expected to attend. The artist is based in Michigan, whose rural landscapes and worn farmhouses are frequent settings for lives imagined in her figurative paintings. An American Magical Realist, Kowch's paintings are frequently compared to those by Andrew Wyeth. "Gust" by Andrea Kowch. Acrylic on canvas, 18 x 14 inches. Courtesy of RJD Gallery. It’s not an unusual occurrence for Kowch to sell out her shows before they open, explained RJD gallerist Richard J. Demato. Her narrative figurative paintings are filled with details and are months in the making as the artist intuitively creates her art. Anticipating the lack of available paintings for the long-planned exhibition, RJD is releasing two new limited edition prints coinciding with the exhibition. Signed prints of the paintings Gust and Nocturne now take their place among a series of limited edition prints of paintings. The originals are currently exhibited as part of "Into the Wind," located in a gallery space on the second floor. The prints also sell swiftly, with several editions on view close to selling out, Demato said. Limited Edition signed prints were made of paintings by Kowch that include Sojourn, The Courtiers, The Feast, Light Keepers, In the Distance, Night Watch and others. “Andrea Kowch: Into the Wind” presents some of the most realistically rendered paintings to date and some of the smallest works. One pair of paintings measures 8 x 8 inches each; another set features paintings of 10 x 10 inches. While these paintings are intimate in size, the tales told are just as expansive as the larger paintings Kowch is known for. "Flame" by Andrea Kowch, 2017. Acrylic on canvas, 10 x 10 inches. Courtesy of RJD Gallery. The paintings are made using models who are a trio of close friends of Kowch. Their faces almost feel as familiar as family to long-standing fans of Kowch's work. In the exhibition, both farmland and sea scenes provide settings for human dramas to unfold in the new works on view. To help celebrate the paintings' arrival (and completion), collectors will fly in to The Hamptons from spots around the globe and will receive their first look at their new paintings, alongside those attending the exhibition, according to the gallery. "High Tide" by Andrea Kowch, 2017. Acrylic on canvas, 8 x 8 inches. Courtesy RJD Gallery. “We’re very proud and excited to have Andrea Kowch join us to celebrate her sold out show 'Into the Wind',” Demato said. On view in adjacent gallery spaces are paintings by gallery artists that include Margo Selski, Rick Garland, Jackee Sandelands-Strom, Drew Ernst, Gabriel Moreno and others. An exhibition of new paintings by Columbian artist and poet Armando Valero is presented in the adjacent front gallery. “El Viento Inquieto” includes five vibrant figurative paintings.